Due to the fact that I completely ran out of space on my C drive, I decided to move my Steam to another larger drive. Using the suggested steps on the Steam page, I deleted everything but the steamapps directory and steam.exe, then moved both to a new drive. 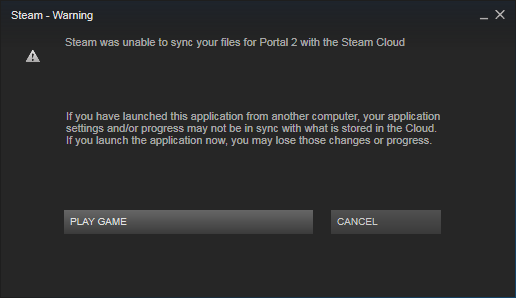 Then I was instructed to start steam.exe from the new drive and let everything auto-populate. I would like to be able to sync with the Steam Cloud (and get my saves back if I haven’t lost them) but the Steam forums are completely useless here. I was wondering what I should do. Not really an outright solution but I’ve had various issues just moving stuff that’s Steam related to a separate drive. So maybe copy game data somewhere else and then delete local files and start to redownload it and copy back in the files so you don’t need to entirely redownload the game(s). Is there a right click option to sync as well? You might try that if there is. Did you press play game and see what happens too? Keep the Steamapps folder that you moved to the new drive, but delete everything else, including Steam.exe and any files it created when you started it on that drive. Uninstall Steam from the Add/Remove Programs Manager. Goto steampowered.com and download steam, reinstall on your C: drive like normal. Next, when you login to Steam, let it update and everything. You should have no installed games. Go to Settings, and then the Downloads section. Find Steam Library Folders. Here is where you can add a new library folder. What I have done is created a folder on my D : drive (or whatever letter your second drive is) called SteamLibrary. In Steam, you select SteamLibrary to be a new library folder. Back to your new drive, you will want to put your Steamapps folder inside the SteamLibrary folder. If I am right, you still won’t have any games installed, but when you want to play a game, start to download it like normal, and ensure that it is being installed to your library on the D : drive. It should download very quickly (if at all) and run through it’s normal install routine, and then you should be able to play the game without any issues. You will probably have to reinstall on a per-game basis each time you want to play a newly moved game. It might also be necessary to Verify Game Cache if they still aren’t working. If you manage your library like this, you can reformat your C: drive and reinstall Windows any time you like, just reinstall Steam and point it at the folder on your D : drive and it will reinstall the games in the registry but all the data will still be there.